That's it: cross-country flying! 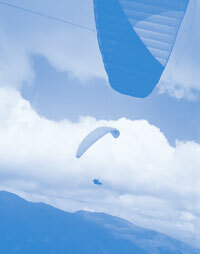 - the ultimate dream of all gliding, hangliding and paragliding pilots... Because it's different. Because it makes you think, sense, imagine...Some compare it to playing chess in the sky, and the reward is the beauty you'll find and the freedom you'll feel. The course consists of radio guidance, wing by wing flying with your instructor, and optional tandem cross-country flying. To enroll on the Cross-Country Training course you need to be able to judge safe flying conditions, takeoff and land unassisted and perform out-landings on non-designated landing fields. You need to be able to manage in extreme situations such as collapses and frontals and to be able to pilot the glider actively. Para Pro level 3, BHPA CP level or our Intermediate course coresspond to these requirements. Open your mind to go higher and further! Skynomad School is also organizing trips and courses abroad all year round. Check the Calendar.